Dimensions 0.25 by 9.75 by 9.25 in. Amazon.com description: Product Description: We have four seasons, spring, summer, fall, and winter, that come in the same order each year. The Earth tilts toward the Sun in summer so it is hot. The Earth tilts away form the Sun in winter so it is cold. These interesting facts about this topic can be discovered in Looking at the Sky - Seasons. 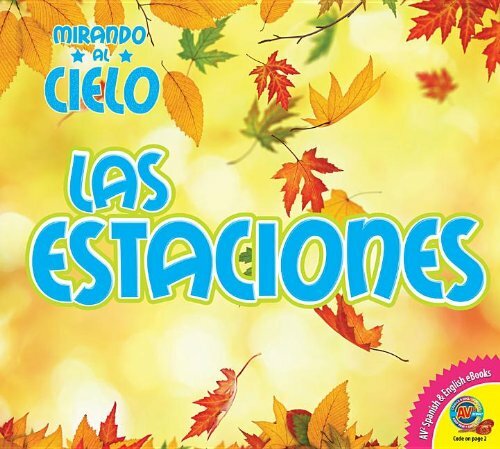 Seasons is part of the Let's Read collection of media enhanced books designed for children ages 5 to 7. These books were created to inspire beginning readers to become independent readers. The AV2 Spanish language collection gives emerging bilingual readers access to both a printed Spanish book and an eBook that provides both Spanish and English translations of the text. Simply enter the book code found on page 2 of this book at www.av2books.com to unlock your eBook. With the click of a button, this eBook can switch between Spanish and English text. Readers can use the eBook to learn Spanish or English vocabulary and sentence structure. About: We have four seasons, spring, summer, fall, and winter, that come in the same order each year.